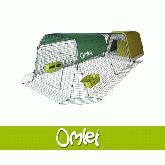 We currently have the OMLET GO and GO UP in stock for immediate collection. Greenfrog houses should be with you in within a week or ordering. We have on display here a range of poultry houses, all of which I can recommend. Your poultry house is the most important decision you need to make once you have decided what hens you would like. All of the houses I sell I fully recommend. I have tried and tested numerous houses and these are the best on the market. 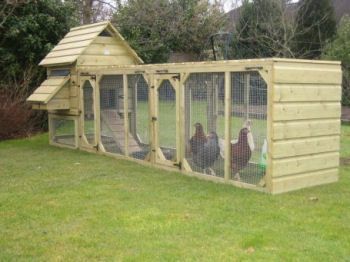 BEFORE YOU ORDER YOUR CHICKEN COOP FROM ELSEWHERE PLEASE COME AND SEE SOME OF OUR HOUSES - I WILL SHOW YOU WHAT FEATURES YOU NEED TO LOOK FOR IN A HOUSE BEFORE YOU ORDER. DON'T MAKE AN EXPENSIVE MISTAKE. We often get asked which is better plastic or wooden? I think the wooden houses look really lovely - you can paint them any colour you want and they can look really quaint in a cottage style garden. Available in literally any size or shape - if you can draw it, it can be made for you. However - if you get a mite infestation it is harder to get rid of than a plastic house. 1 - NEVER BUY A WOODEN HOUSE WITH FELT ROOF - this will harbour lice and mites. 2 - Ensure the perches are removable - mites will happily hide under the perches and its only my removing them can you clean them and treat to get rid of mites. 3- I don't recommend a sliding out tray - they would be great if they work but wood often swells when damp and this stops them being easy to slide out. 4 - I prefer a door that opens outwards instead of up and down - the runners that the doors have sliding up and down can become difficult if the wood swells... the runners can also harbour mites. 5 - the houses we sell - the entire side comes off for cleaning - we find that this is quite simply the best way and easiest way to clean out a wooden house. 6- It is worth retreating wooden houses each year with a suitable preservative to get the most out of the house life. 7 - quality of wooden houses varies enormously - make sure you view before you buy - is the wood heavy? or is it thin and flimsy liable to falling over in the wind? Or worse falling apart after 12 months. 8 - resale value of a wooden house - if you manage to sell one tends to be little resale value. 1 - Plastic are maintainance free - no need to treat or preserve each year. 2 - To give a good clean out you literally get the hose pipe out and blast any dirt away. 3 - Perfect for young or old birds as the houses can be fully sanitised between hatches so no risk of disease spreading. 4 - You CAN still get mites in plastic houses but should you get an outbreak there are FAR less nooks and crannies for them to hide away - again a good clean with the jet spray and then a treatment of mite powder will tend to erradicate even the toughest of infestations. 5 - There are limited choices of plastic houses on the market - its not so easy to get a tailor made house to fit your exact dimensions. We deal with GREENFROG (eco friendly) and also OMLET. Between the two manufacturers they provide a solution to most poultry keepers - from houses for up to 3/4 hens up to 20 hens available. If it helps you make a final decision - most of the houses we use are now Plastic, we will gradually change them all to plastic... (not that I am trying to persuade you one way or the other!!!!!) I just love them!!! This decision generally comes down to how much space you have in your garden.. No-one can argue that the more space the birds have the happier they are. A lot of problems can be overcome if the birds are let out to range around a large area. Boredom is releived and feather pecking becomes less of an issue. 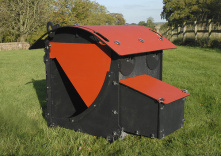 However if you have a fox problem in your neighbourhood then a restricted run that is fox proof is far safer option! We find it the easiest and most flexible way to fence off an area in your garden. It can easily be moved and is flexible enough to bend around awkward corners of the garden. If you compare the cost of this to the cost of a run attached to your house - this is significantly cheaper and yet flexible.. If you have a fox problem during the day then I would definitely stick to a large walk in run. You can build them yourself or get a joiner to make one for you..
for their houses. We do not stock these and they need to be purchased direct from OMLET. We use a range of runs for our poultry... From open runs set up on grass to small undercover runs for some of the birds that need to be kept dry. Below is a table to make it easy to compare the prices of the various houses dependant on size and material. Please remember that some houses come complete with run and others the run would be an extra. Delivery as well would be extra. For more details click on any house title. Those highlighted we have on display here. Due to the rise in popularity of plastic houses we no longer stock Wooden Houses. We can however still order them to be delivered direct to your home. Houses are made to order and lead time is normally 2-3 weeks from order. Payment is required at point of order.